A brilliant debut. Ryan Graudin explodes on the scene with a fast paced gritty thriller set in the decaying seething walled city of Kowloon, days before it was raised to the ground. At first you think it is a medieval setting and it is jarring to discover the modern city with all its luxuries is just next door. The people in the walled city are imprisoned by a way of life, the drugs, prostitution, thieving, seemingly they know no other way of living. But this is no dystopian vision of the future, it was a real place, just as the favelas of Brazil are real and life is cheap with people piled high upon one another. The third character is Dai, a young drug runner, loner, sharp-boned, good looking, who needs a fast runner like Jin Ling for his own ends. He has a deadline – 18 days to get what he wants. Dai isn’t like the other Walled City residents. He is educated, aloof, but also sad. He thinks of the walled city as a City of Pain. Dai reels Jin Ling in to his scheme, he does not know she is a girl or that she seeks her sister, Jin Ling does not share easily. She falls in because she is desperate to search Longwai’s brothel, her last chance to find Mei Yee. 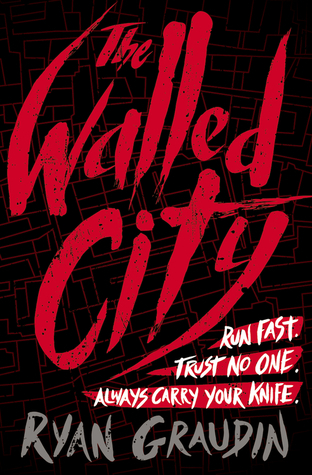 The Walled City is most satisfying read of the year and I can’t wait to read more from Ryan Graudin.